Australian Morris Minor Car Clubs' 19th National Rally celebrating 70 years of Morris Minors. It's hard to believe that it's been 21 years since the Canberra Region Morris Minor Club hosted a national rally in its region (mainly because the number of Easter events here made accommodation and facilities almost impossible to book) but we're about to put that to rights. 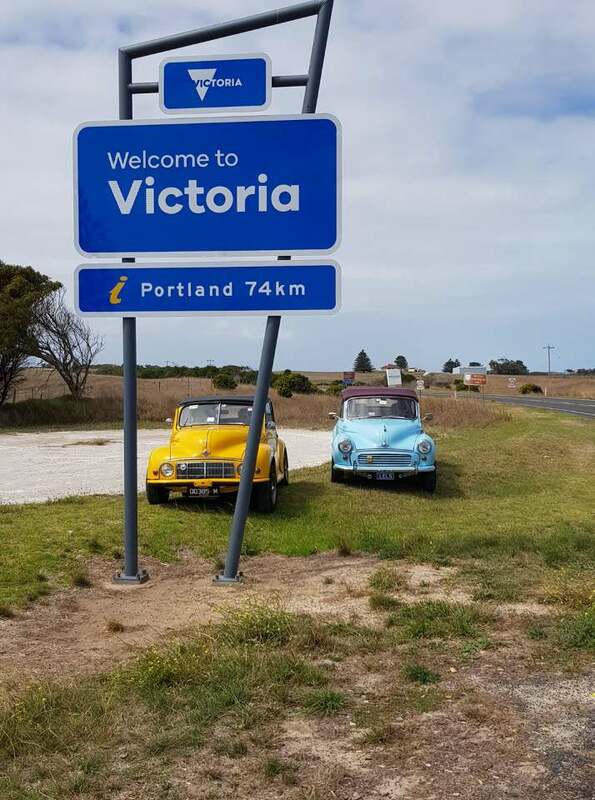 At the Victoria delegates' meeting, we flagged an event on the 21-23 September 2018 weekend to mark the 70th anniversary of the production of the first Morris Minor in conjunction with the Australian Morris Minor Car Clubs' 19th National Rally. We were encouraged by the positive reception our proposal received but time is pressing. We need some indicative numbers to help with planning. We are developing a comprehensive program, including opportunities for the sort of camaraderie that has highlighted previous rallies. Over coming months we'll regularly keep people up to date with our preparations. As a teaser we're planning to include most of the usual events associated with a National Rally; chances to catch up with MM enthusiasts, to have some fun, and to tour our wonderful region. A highlight will be a display marking the 70th anniversary, planned for central Queanbeyan. Contrary to the bad press that's generated by our fly-in, fly out workforce, the Canberra region is one of Australia's best kept secrets. Those of us who live here full-time are proud to have this opportunity to show it off to you. We're inviting you and your members to come and see for yourselves. At this stage, it would be very helpful for our planning (for venues and ordering regalia and mementoes) to have expressions of interest, including possible numbers, of people (and cars) who are considering attending. We ask you to circulate to your members or discuss this at your February club meeting and get back to us with an idea, non-binding, of participant numbers by the end of February. We're not looking for a rock-hard commitment, just a show of hands, at this stage. To help with your planning, our regular updates will include early information about where to book accommodation, so your members can arrange to come and visit our wonderful part of the world. We would encourage members planning to attend to email us at this rally address as early as they can so we can communicate directly with them. We look forward to hearing from you by the end of February. I for one will be attending, looking forward to it. I feel sorry that the Canberra Club has decided to go ahead with this following the poor turn out last year. The Morris Minor family want to return to the 4 day Easter event as we used to have every two years. I feel this is two early after the last one and not enough days together with the fact that it classes with the All British Day at Kings School which yields as many Morris Minors as the last Rally did. Already most Clubs have decided to support this day. yes the Morris Minor family in Australia, would love to go back to the old formula, of the four day Easter rally. Hopefully a club will take up the challenge of running a rally of old, but we must face the fact that as a group, we are getting older and do not have the willing man power with in the individual clubs to run a rally. This is why at the Albury rally, we tried to finally put in place a national body, to run the rally's, this proved to be unworkable, due to the shortsightedness of some, that had the idea the Body was then going to try and control the clubs. So we now have to move on. the Victorian club did a wonderful job, with in the boundary's of the man power they had, I would have liked more, but one that has been involved with the running of a full, four day rally you need a lot of help to make it work. so where do we go from here, I am do not have the answer, but we do need to be a bit more compromising and above all supportive of any club, that would give it a go, with in what ever format they can provide, we can not let this just die. As somebody that attends a number of different events over the year, date clashes are a problem, you have to work out which event is more important to you, and attend that one, to propose that an event date should be changed, in order for it not to clash with another event that you would like to attend, is in my opinion very rude and selfish. I again give my full support to the Canberra club, for having a go and trying to tie two important things together under the one event. lastly remember we are all members of social car clubs, the cars bring us together but it is the people and friends that make it so much fun. The rally now has a facebook page for you as well. Thanks to a strong response rate, we’re pressing ahead with organising the Morris Minor Clubs of Australia 19th National Rally and a celebration of 70 years of Morris Minors on the weekend 21-23 September 2018. So in this email bulletin is some information to help you book accommodation and to stay up to date with planning as it proceeds. We’re trying to keep communications as much as possible to an electronic medium, there are some useful links to the information you need. First of all, take a look at our Facebook page: https://www.facebook.com/Morris-Minor-National-Rally-2018-Canberra-433630257069480/ Some people have already cottoned on and we’ve had some very positive comments on the page so far. You don’t have to have a Facebook account, but it certainly helps. Please note that, in keeping with our focus on fun and camaraderie, the Facebook page will be moderated, gentle reminders and suggestions accepted, robust comments will probably not make the cut! The rally will be centred on Queanbeyan, just over the ACT-NSW border, with registrations and a number of activities at the Sutton Road hill climb circuit on Friday. You might opt to use your Friday socialising at the circuit as you register, and then select one of the self-drive tours we’re planning. There’ll be a welcome function on Friday evening that will flow on from the activities at registration. This will be a pay as you go event at a local eating venue in Queanbeyan. Saturday will be the display day, in leafy Queanbeyan Town Park, just next to Qbn’s town centre, followed by a celebratory dinner, complete with optional quiz night, also in Queanbeyan. Sunday will be the opportunity to tour en masse to some of the wonderful sights and sites we’ve talked about in our first two messages. We have a pretty fair idea about where we think you should go, but if you have any particular ideas about where you’d like to go then let us know say, by 30 April, so we can consider them. We already mentioned that the week leading up to the rally is a Parliamentary sittings week and if you arrive early you can watch Parliament in action. Question Time in the House of Representatives requires a booking by ringing Parliament House (02 6277 7111) and asking them to reserve you a seat. Otherwise you can generally get into the galleries without booking. You might even like to contact your local MP and tell them you’re visiting Canberra and ask if there’s time for a cup of tea and a chat in their office! See the website for what else is on https://www.aph.gov.au. We’ve also mentioned Floriade, we’ve put in some information about what’s on in our region below and the next few bulletins will have a few other suggestions of things you might like to do/see while you’re here and, while the rally will be centred just over the border in Queanbeyan, it’s only a short drive to visit them. Some people use sites like TripAdviser or Wotif to get additional information about places to stay and eat at, so check out what others are saying. A selection of events and places to visit while you’re in Canberra. Next month’s message will have an entry form and even more details so look out for it. We will be coming. Booked accommodation already both going up and coming back. Keep the cards and letters coming in, but even more importantly, time to get registered! Seriously, registrations for the rally, in the Canberra region from 21-23 September, are coming in steadily. It will be enormously helpful to us in organising grille badges, the layout of the display day and table settings for the two pay-as-you go dinners if we can have your details sooner rather than later, so keep them coming in. Our Facebook page continues to receive a great hit rate: https://www.facebook.com/Morris-Minor-National-Rally-2018-Canberra-433630257069480/ Apart from info about the rally itself, it has links to some of the great things happening in and around Canberra and Queanbeyan in September. We’re getting broad representation across the years with entries from ’52, ’53, ’56, ’57, ’58, ’59, ’60, ’62, ’63 and ‘71. And we have all body styles. It would be good to have all year models and body styles for those years to complete the show, so if your car is a rare one, we’d love to see you here. Around the country Bowlos have underpinned the social life of many communities. We’re delighted that the Queanbeyan RSL Memorial Bowling Club has agreed to host our dinner on Saturday night: www.qrslm.bowls.com.au . It hosts the longest standing Chinese restaurant in Queanbeyan, but also includes traditional club staple dishes on its menu. We’re developing a suitable program of activities to make the night a special celebration of the 70th anniversary. We’ve started detailed planning of the tour cruises around some of the region’s best sights and sites, including some of the national institutions that dot the shores of Lake Burley Griffin. The idea will be to have several packets of MMs zipping around the city, stopping somewhere nice for lunch and all arriving back at the Sutton Road hill climb centre for a final farewell cuppa. Just a reminder that we would like to locate all perpetual trophies so we can discuss arrangements to have them in Canberra in time. A final call for any agenda items for the Delegates’ meeting to enable their circulation for proper consideration by clubs – they should be forwarded to morrisminorclubsnationalrally@gmail.com by no later than 25 June 2018. Until we write next month, get those entries in!! Have a safe trip Graham, we're looking forward to seeing you all in the Canberra region. well it is all done and dusted, with a great roll up of cars, and some very good ones at that. A big Thank You to the Canberra Region Morris Minor Club, for a job well done, it was a fantastic weekend with a lot of very happy Morris Minor owners. the weekend was filled with great cars, great friends, and no apparent hick ups. I would like to say that all the members of the MMCCNSW that attended, had a great time and very happy that they made the effort to come. From me personally, I would like to thank ALL the entrants, for coming along and backing the rally, and the Canberra club, and keeping the rally alive.